Angular apps are modular and Angular has its own modularity system called NgModules. An NgModule is a container for a cohesive block of code dedicated to an application domain, a workflow, or a closely related set of capabilities. It can contain components, service providers, and other code files whose scope is defined by the containing NgModule. It can import functionality that is exported from other NgModules, and export selected functionality for use by other NgModules. Every Angular app has at least one NgModule class, the root module, which is conventionally named AppModule and resides in a file named app.module.ts. You launch your app by bootstrapping the root NgModule. While a small application might have only one NgModule, most apps have many more feature modules. The rootNgModule for an app is so named because it can include child NgModules in a hierarchy of any depth. An NgModule is defined as a class decorated with @NgModule. The @NgModule decorator is a function that takes a single metadata object, whose properties describe the module. The most important properties are as follows. declarations—The components, directives, and pipes that belong to this NgModule. exports—The subset of declarations that should be visible and usable in the component templates of other NgModules. imports—Other modules whose exported classes are needed by component templates declared in this NgModule. bootstrap—The main application view, called the root component, which hosts all other app views. Only the root NgModule should set this bootstrap property. The export of AppComponent is just to show how to export; it isn't actually necessary in this example. A root NgModule has no reason to export anything because other modules don't need to import the root NgModule. 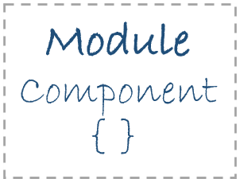 NgModules provide a compilation context for their components. A root NgModule always has a root component that is created during bootstrap, but any NgModule can include any number of additional components, which can be loaded through the router or created through the template. 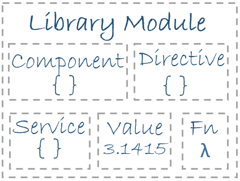 The components that belong to an NgModule share a compilation context. A component and its template together define a view. A component can contain a view hierarchy, which allows you to define arbitrarily complex areas of the screen that can be created, modified, and destroyed as a unit. A view hierarchy can mix views defined in components that belong to different NgModules. This is often the case, especially for UI libraries. When you create a component, it is associated directly with a single view, called the host view. 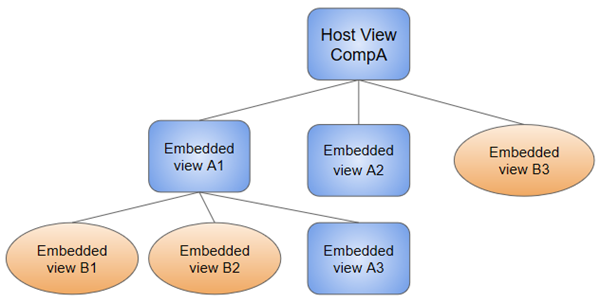 The host view can be the root of a view hierarchy, which can contain embedded views, which are in turn the host views of other components. Those components can be in the same NgModule, or can be imported from other NgModules. Views in the tree can be nested to any depth. The hierarchical structure of views is a key factor in the way Angular detects and responds to changes in the DOM and app data. In the example of the simple root module above, the application module needs material from within the BrowserModule. To access that material, add it to the @NgModule metadata imports like this.